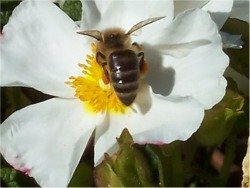 Usually, honey bees can look after themselves for food, as long as there are plenty of nectar and pollen rich flowers in the area. Honey is the best thing for bees – it has the nutrients they need. However, there are times when feeding honey bees is necessary. For example, following a poor, wet summer, the bees may then be faced with a long winter, with little in the way of honey reserves to see them through. In such circumstances, providing food for honey bees in the form of sugar will be essential for their survival. Always use good, granulated, white cane sugar. If you can afford organic granulated sugar, then even better. Never, EVER use ‘soft brown’, unrefined, or Demerara sugar, as these may cause dysentery in bees. Stick to WHITE can sugar to be safe. Heat 500 ml of water to boiling point in a pan. Remove from heat, then once the boiling stops, stir in 2 lb of white granulated sugar, and stir until completely dissolved. Once cooled it should be clear, and can then be transferred to a bee feeder. To make fondant, boil a pint of water in the same way as above, but add 5lb of white cane sugar. Some beekeepers add a dash of organic cider vinegar. Heat the sugar and water to a temperature of about 115 °C / 240°F, and keep stirring to avoid burning the mixture in the pan. Once all the sugar is dissolved, the liquid should be thick and clear. A spoon of the bee’s own honey can be added to the mixture. The mixture can them be added to a clean dish and left to set. NOTE: Never, ever feed honey to bees, other than their own. Remember to ensure your bees have year-round access to water.